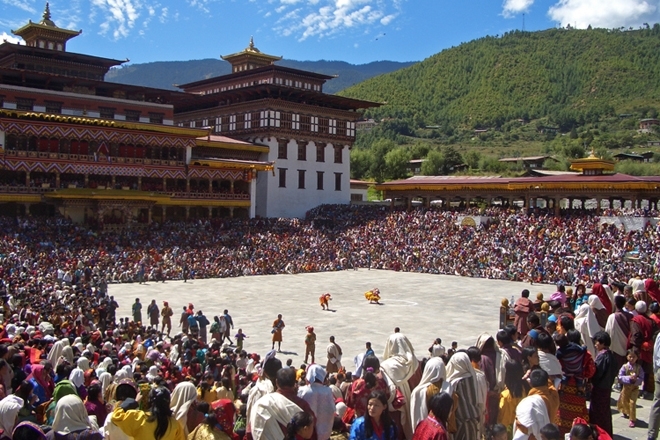 Festivals are a significant part of Bhutan's culture. Most festivals, also known as a 'tsechu', are of great religious significance and are mostly celebrated through music and masked dances. Tsechus attract high numbers of Bhutanese people as they believe by attending these special celebrations they gain religious merit as well as enjoying a fine social event. Below are just a few of Bhutan's major festivals, all of which can be visited on a Mountain Kingdoms holiday. Thimphu Tsechu is one of Bhutan’s most important festivals. It is a three day event celebrated by thousands at Tashishhodzong, Thimphu’s monastery. Like most Bhutanese festivals, Thimphu Tsechu is a religious celebration, during which monks perform dances in colourful masks to entrance evil forces that have accumulated over the ground during the previous year and prevent their harmful intentions. Which holidays attend this festival in Bhutan? Chorten Path Trek, Druk Path Trek, Definitive Cultural Tour of Bhutan, First Class Bhutan, Gentle Walking, Bhutan, Thunder Dragon Trails in Style walking holiday, Cultural Highlights of Nepal, Bhutan & Tibet tour. During the colourful Paro Tsechu, music and ceremonial masked dances are performed to represent Guru Rinpoche and celebrate his significant life. Many people from even the most remote villages join to celebrate, socialise and have fun. By attending the festival and witnessing the performances they believe they will achieve merit and cleanse themselves of any sins. Which holidays attend this festival in Bhutan? Chorten Path Trek, Druk Path Trek, Definitive Cultural Tour of Bhutan, Gentle Walking, Bhutan, Thunder Dragon Trails in Style walking holiday. Punakha Tsechu is held in the magnificent Punakha Dzong, one of the most spectacular and important in the Kingdom. The festival was introduced as a commemoration of the Bhutanese victories over the Tibetans. During the festival there are colourful masked dances and other dramas enacting the days when the Bhutanese people gathered to expel the Tibetan forces out of the country by ushering in a new-found internal peace and stability. The Black-Necked Crane festival takes place at Gangtey Gompa in Phobjikha to celebrate the annual arrival of the endangered and majestic cranes. The festival consists of traditional masked dances, crane dances, songs by the local school children and plays. The festival has the advantage of receiving relatively few western visitors and offers a real insight into the Bhutanese 'at play' as they showcase their cultural heritage and skills. Which holidays attend this festival in Bhutan? Definitive Cultural Tour of Bhutan, Gentle Walking Bhutan. Held at one of Bhutan’s oldest temples, Jambay Lhakhang Drup is one of the country’s most ancient and sacred festivals. The three day celebration attracts village people to the temple for singing and dance rituals. There are different categories of dances, those that are intended to give moral instruction, those designed to drive away evil spirits and those that celebrate the Buddhist faith in its many guises. A particular highlight is the midnight fire ritual where crowds gather to witness a ritualistic naked dance. Which holidays attend this festival in Bhutan? Rodang La Trek. If you would like us to organise a private trip to Bhutan, taking in one of these fantastic festivals, then contact us and we can create a Tailor Made Holiday especially designed to suit your travel requirements.